It’s Jane coming through to review two products with ingredients which claim to deliver optimum results when used together - I’m talking about Vitamin E and Vitamin C. For those who aren’t familiar, Vitamin E and Vitamin C have complementary functions in their role as antioxidants, thus making them more effective and enhancing results when used together in health and skin matters alike. This science has always intrigued me (you can read more about it here) because my skin responds so well to Vitamin C, I wanted to test if it could really get that much better by using it with Vitamin E. My only hesitation was due to my oily, acne-prone skin and I totally balked at the introduction of a naturally oily ingredient such as Vitamin E into my routine. I figured it was finally time to take the plunge and see if it really delivers. In this post, I recap my experience with the By Wishtrend Vitamin 75 Maximizing Cream (containing Vitamin E) both before and after incorporating the By Wishtrend Pure Vitamin C 21.5% Serum into my routine. Did I notice maximized results per the cream’s namesake? Let’s find out! Wishtrend is an online K-Beauty retailer based in Korea which curates popular brands such as COSRX, Klairs, and Mizon, as well as creates effective products for its exclusive house brand, By Wishtrend. By Wishtrend has created countless cult faves such as the 5% Mandelic Acid Prep Water and the Pure Vitamin C 21.5% Advanced Serum - the latter product being part of today’s review. Earlier this year, Melissa from Wishtrend reached out to us about trying products and of course, we were ecstatic. I’ve had the pleasure of trying 2 other By Wishtrend products thus far: their Green Tea Enzyme Powder Wash and TECA Barrier Cream to which (spoiler alert) I was pleased with both and plan to review the TECA Barrier Cream in a future blog post. Elizabeth and I both selected a product; I chose the By Wishtrend Vitamin 75 Maximizing Cream since I already had the Pure Vitamin C 21.5% Serum in my stash. Elizabeth went with the Klairs Freshly Juiced Mask (stay tuned for her review!). This product is the 3rd creation in Wishtrend’s Vitamin line, after the 21.5 Vitamin C Serum and Natural Vitamin 21.5 Enhancing Sheet Mask. 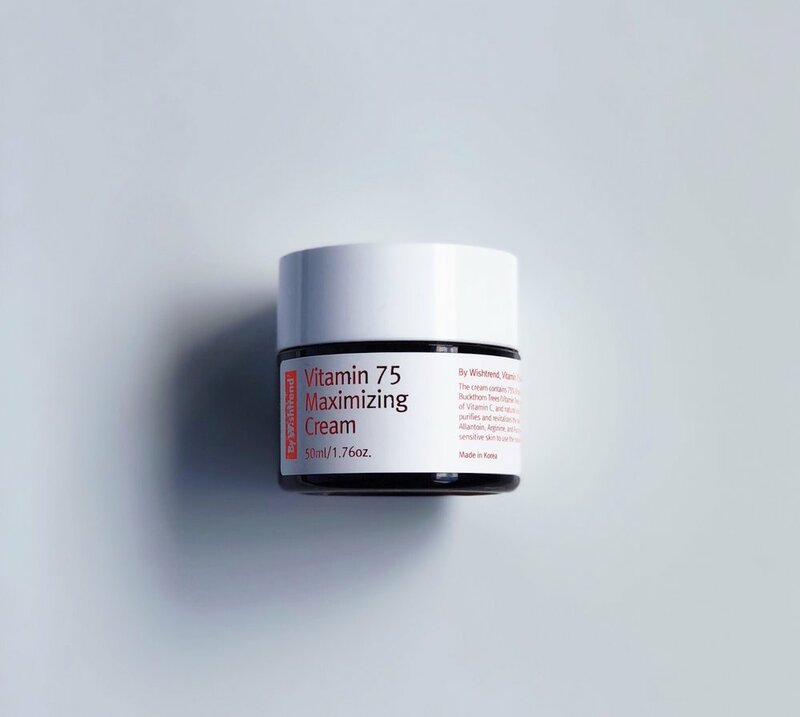 It was created specifically due to customer feedback who have used these two items in the Vitamin line and wanted more - thus, Vitamin 75 Maximizing Cream was born! The cream contains natural vitamin E which is known to stabilize vitamin C and make it more effective. Using it in tandem with their Vitamin C 21.5 Advanced Serum is recommended for optimum results. Wishtrend’s Vitamin C serum contains the highest concentration of Vitamin C I’ve seen (COSRX Triple C Lightning Liquid being 20.5%). I originally purchased this product from Wishtrend during their Black Friday sale because I love Vitamin C serums and have noted spectacular results from Sokoglam’s exclusive COSRX Triple C Lightning Liquid. I couldn’t wait to see how this one stacked up! The main draw of this cream is that it contains 75% Hippophae Rhamnoides Water from Sea Buckthorn trees which increase the absorption of Vitmain C. It also includes natural oils which contain Vitamin E, which we know also works in tandem with Vitamin C. According to COSDNA, there are potential acne triggers and irritants present in this cream: butylene glycol (1 - acne), ceteryl alcohol (2 - acne, irritant), dimethicone (1 - ance), beeswax (0-2 - acne, irritant), carbomer (1 - irritant). There are only 10 ingredients present in the Vitamin C Serum, which also contains 70% Sea Buckthorn Water and helps stabilize the 21.5% ascorbic acid (aka Vitamin C). The serum also contains sodium hyaluronate which helps to retain moisture along with panthenol which is moisturizing as well. According to COSDNA there are no potential acne or irritant triggers. It has faint citrusy scent that I find refreshing. Mostly odorless, with the slightly acidic/metallic-y scent of Vitamin C.
Medium-weight cream. It is somewhat thick to spread out initially, but the 75% Hippophae Rhamnoides Water allows it to absorb easily. Clear, watery essence, typical of vitamin C serum. It spreads easily and is only slightly more sticky than the COSRX Triple C Lightning Liquid, likely due to its higher concentration of Vitamin C. It only remains sticky upon application and I found no problems with absorption. Comes in a 50ml dark plastic jar with spatula. The cap is quite large and sometimes the cream gets trapped within the grooves of the jar. Comes in a 30ml dark glass dropper bottle. I applied the cream by doting it around my face and gently pressing it into my skin, working my way outward. The instructions say to apply it to the center of the face and spread it to the outermost parts of the face in light tapping motions. After initial application I can definitely feel a layer of cream sitting on my face; it isn’t heavy, but it’s there. I find that you kind of have to press it into your skin to spread it since it is quite viscous, then you can pat it in. However, after gently patting it in, it absorbs fairly quick without any sticky residue. After applying I can see the slightest oily shine on my face that’s on the borderline of oily and dewy. After a month of using the cream alone, I added the Vitamin C Serum to my nighttime routine. I take a dropper full of Vitamin C serum and place it into my palm, then I pat it all over my face. (I don't have an issue using so much every night because I can never finish a 1oz serum before it starts to oxidize and turn yellow.) I wait about 10-15 minutes after applying before moving to the next step in my routine. It's important to remember to use sunscreen during the daytime when using a Vitamin C serum in your routine, as it can increase your skin's sensitivity to the sun. I incorporated this into my routine back in February, at the peak of San Diego winter. My skin was in decent shape, and I was not breaking out at the time I introduced this product. My skin before using the Vitamin 75 Maximizing Cream. After a month of using just the Vitamin 75 Cream, I noticed minimal changes in my overall skin tone and evenness but did not see a drastic difference in my skin. During the period of testing my skin was breaking out periodically for a myriad of reasons which I can’t attribute solely to this cream. I prolonged the testing period just to make absolutely certain my skin was okay with this cream. I debated if this cream was ultimately causing more breakouts than it was helping, I even ceased using it for a few days during the testing period. Ultimately, I do not think it caused the majority of breakouts I had but using this cream didn’t soothe my skin or provide any sign of relief either. I relied on several other spot treatments and creams to overcome my breakouts which may have overwhelmed my skin even more. At this point my skin has settled down and has grown accustomed to the cream. It was hard for me to see a difference in looking at my skin daily but after reviewing the before and after photos, I can tell it did have a slight impact on my skin's clarity and tone. I started to see more visible results once I used the cream with the Vitamin C serum. Since I had several breakouts during the original testing period of the cream, I developed new acne scarring and hyperpigmentation. I’ve now used the cream and serum together for roughly 3 weeks and noticed a visible difference in my skin. It looks brighter, more even-toned, and my scars are beginning to fade. I am loving the results so far and I’ve received compliments that my skin condition has improved since using both together. My left side is a problem area for me, but my acne scars are beginning to fade. Ignore the new pimple that decided to pop up this week! My right side looks significantly clearer! I noticed minimal results in my skin when using the Vitamin 75 Cream by itself, however, after introducing the Vitamin C Serum into my routine results took effect quicker than either product would have on its own. The cream hydrates well and has probably saved my skin this Winter more than I’ve realized, but it may be a tad too heavy for me in the summer and warmer months where it will likely turn my skin oilier. I like the Wishtrend 21.5 Vitamin C Serum quite a bit, and I am a believer that the two products truly work better in tandem. I’ll continue to use this combo in my nighttime routine for as long as the products are viable and the weather stays dry. I would recommend using both products simultaneously for best results. You can purchase both products at Wishtrend: Vitamin 75 Maximizing Cream - $27.99, Vitamin C 21.5 Advanced Serum - $24.99. You can also save 30% by purchasing the duo together in the Vitamin Starter kit for $40.59 here! Have you tried Vitamin C and Vitamin E products together? Did you see results? If you haven’t, are you interested in trying them? Let us know in the comments! *Disclaimer: The Vitamin 75 Maximizing Cream was provided by Wishtrend for testing purposes, however, all opinions are my own. This post also contains affiliate links. We will receive a small commission for any purchases made through our affiliate link. All proceeds from our sales will go towards maintaining Devoted to Dew.